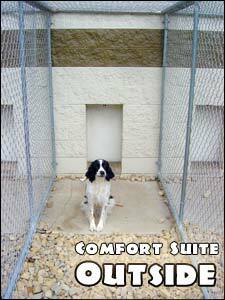 Our Comfort suites are 4' x 6' on the inside with a sliding door that leads to their private 4' x 12' outdoor run. There are 14 of these suites and are best suited to first-time boarders, nervous dogs, or those that would like a little pampering. This area tends to be quieter than the Standard suites since there are fewer dogs. There are shared televisions on the walls where the dogs enjoy movies from Beethoven to Lady & The Tramp. 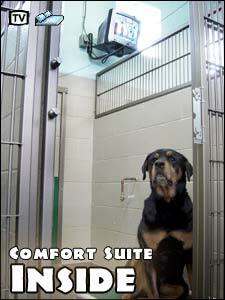 A raised, chew–resistant Kuranda bed is included each of these suites, but if you'd like to bring in bedding from home as well, you're always welcome. We feel that it eases your dog's transition to our place if they have something that smells like home. Please try to make it machine washable so we can clean it in case of an accident, and no irreplaceable items, please. Toys are always welcome, so bring those in, too! Please note that the only restriction we have is if you bring in a rawhide for your dog, we'll take it away if it gets to a size where it can become a choking hazard. The suites are sealed from the floor to the ceiling with an epoxy coating which makes it difficult for bacteria to grow, and also makes it easy for us to clean and disinfect. We have a 3-part epoxy floor with in–floor heat that keeps the floor a nice 70 degrees so everyone stays nice and warm in the cold months. An air conditioning system is employed for the warmer months. Each suite has its own water spigot (fresh water is available at all times) and dedicated floor drain to ensure minimal mess in case of an accident. A window above every suite lets in plenty of natural light. Every dog has the opportunity to go out to their run every three hours for a potty break, to stretch and enjoy the day. Let out times start at 7 a.m. and end between 9 & 10 p.m.